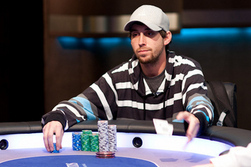 John Dibella got into the 2012 PokerStars Caribbean Adventure Main Event by winning a $1,000 buy-in satellite. He survived five days to enter the final table as one of three amateur players remaining, in the middle of the pack, with three big-stacked professionals directly on his left. He left as this year’s PCA champion, topping the 1,072-player field to earn $1,775,000 after a deal heads-up and 2,400 Card Player Player of the Year points. Prior to winning this massive title, the New York stock-trader had just $69,896 in tournament earnings to his name. Dibella’s biggest score coming from a tenth-place finish in a 2006 WSOP $1,500 no-limit hold’em event. Dibella survived to four handed play with a roughly 5.3 million in chips when this crucial hand arose. 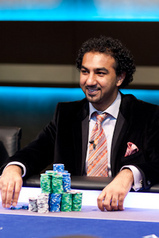 The incredibly active Faraz Jaka raised with the J J only to have Dibella move all-in with the 4 4 . Jaka had started the hand with around 10 million, and was an 80% favorite to eliminate Dibella and take a solid chip lead. The 4 had other plans, however, as it rolled off the deck on the flop to give Dibella a set and a dominating lead in the hand. Jaka did not improve, and took a massive blow to his stack as Dibella began his rise. The rollercoaster ride continued, with Jaka mounting a comeback and eliminating Xuan Liu, the first female player to ever make the PCA final table, in fourth place. Jaka then played a massive pot against Kyle Julius, five betting all-in with K J and losing a roughly 20-million chip pot when he failed to beat Julius’ A K . Julius could not hold onto the lead for long, as he ran pocket aces into Dibella’s flopped set of sevens, sending a roughly 18-million chip pot Dibella’s way. Eventually a short-stacked Faraz Jaka was all-in with A J against Julius’ K 10 , which promptly made two pair on a K 6 2 10 A board to send the pro to the rail in third place for $755,000. Heads-up play began with Dibella holding a solid chip lead over Julius. The prize pool still had $3.275 million left to be paid out, and the two players decided to take $1.5 million each and play for the remaining $275,000. Dibella won the majority of the hands heads-up, increasing his lead to more than three-to-one, at which point the final hand came up. With blinds at 200,000-400,000 and a 50,000 ante, Julius raised to 825,000 on the button with the 9 6 . Dibella defended his blind with the 6 5 and flopped a flush draw after the A Q 3 rolled off. Dibella checked-called a 725,000 bet from Julius and the turn brought the 8 .Both players checked, and the 10 hit the river filling Dibella’s flush. He lead out for a bet of 1 million, at which point Julius seemingly attempted to represent the flush himself by moving all-in with just nine-high. Dibella quickly called however, with his winning flush securing his first ever tournament title and a $1,775,000 first-place prize. 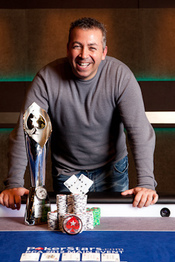 Photos courtesy of PokerStars and Neil Stoddart.